Until the volcano started to enter the ash emission stage on Friday, its emissions since Nov. 25 had been mostly composed of steam, though there was some ash mixed in, the Indonesian Disaster Mitigation Agency head said. Karangasem, Indonesia: A rumbling volcano on Indonesia's tourist island of Bali ejected greyish-white plumes of ash on Friday, a timelapse sequence of Reuters images showed, a reminder, if it were needed, that its weeks-long period of activity has not ended. 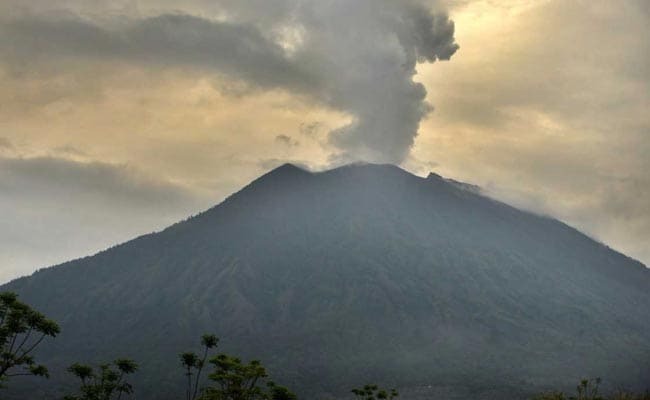 Ash spewed as high as 2.1 km above the crater during one emission at 7:59 a.m. (2359 GMT, Dec. 7), within a radius of about 5 km around the mountain, the Indonesian Disaster Mitigation Agency said. "Sometimes it is hard for the lava and magma to come out, and when there is pressure, it will spew ash," agency head Gede Suantika told Reuters. Until the volcano started to enter the ash emission stage on Friday, its emissions since Nov. 25 had been mostly composed of steam, though there was some ash mixed in, he said. The 9,800 ft Mount Agung volcano, which is capable of very violent eruptions, has shown a marked increase in activity in the last few weeks, stoking fears of a repeat of an eruption in 1963 that killed more than 1,000 people. While hot magma has produced an eerie orange glow just above the crater, and thousands of villagers have fled homes on the mountain's slopes, Agung's ejections of material have been small this time. Authorities raised the alert status to the maximum after it started erupting last month, causing travel chaos by closing the island's airport for three days last week. Operations were normal on Friday at the international airports in Bali and on nearby Lombok island.